And Sasha"s favorite color is pink! 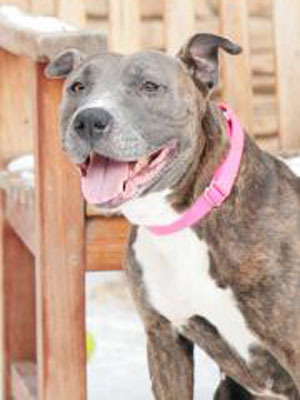 Meet Sasha, a 10-year-old female Pit Bull mix with a beautiful grey and brown brindle coat. She’s lived with one family her entire life, but due to a new landlord, was brought to Lollypop Farm in December. Sasha is a bit confused by shelter life and is patiently waiting for someone to come and give her a new forever home. This sweet girl has lots of love to give. Show her a collar and leash and you’ll be her new best friend! Sasha weighs 50 pounds and needs to go to a home with children six or older. She is eligible for our Seniors-for-Seniors program, so approved adopters 60 and older can bring Sasha home free of charge! Come out and meet this wonderful girl, and consider giving her a comfortable retirement home! Angel, the cat from last week, was adopted!